☼ PROMOTE PLANT GROWTH - This LED Growing Light gives off targeted wavelengths lights which can be fully absorbed by plants to help accelerate the growth of indoor plants, potted plants, foliage plants, flowering plants, succulent plants. Our LED growing light imitates sunlight and speeds up development to help plants bloom and grow leaves and seeds in perfect health! ☼ NEW UNIQUE DESIGN - 1. two heads achieve 360-degree coverage of plants. It can cover a larger area in the case of the item itself does not take up space. 2. double switches make it more convinient and safty to use. One switch independently controls one lamp head and you needn't to plug in/out the socket frequently. ☼ ADJUSTABLE AND FLEXIBLE GOOSENECK - 360° Gooseneck with powerful clamp to clip desks or tables, can be bant to any direction and angle, also adjust the distance between the light and plant according to plant needs, offering a full range of flexibility for convenience and enhanced plant growth. 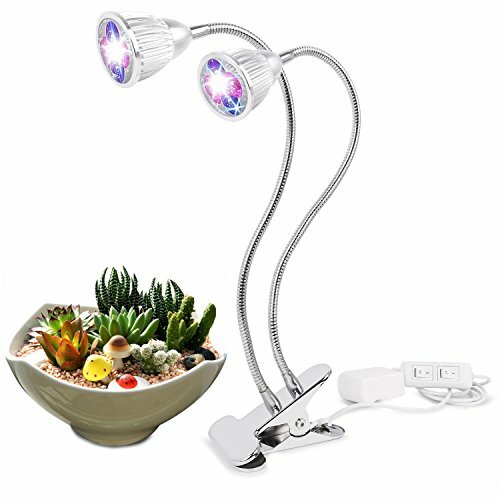 ☼ FOR LUSH GREEN INDOORS - Liven up your home or office desk décor with lush blooming plants growing in health and safety with this high-end dual grow light bulb! suitable for balconies, greenhouses, darkroom, office and so on. Widely apply to the culture solution, gardening, family balcony seeding / seedling / breeding, Flower Show, potted plants, especially when the plant needs extra light when raining, snowing, dark indoor, etc. ☼ MINIMUM POWER CONSUMPTION - Ultra bright, lower heat and lower power consumption, high luminous efficiency and long service life.It is easy to adjust the light towards any directions if the plants need.